Watarrka National Park includes the western end of the George Gill Range. This scenic landscape of rugged ranges, rockholes and gorges acts as a refuge for many plants and animals. 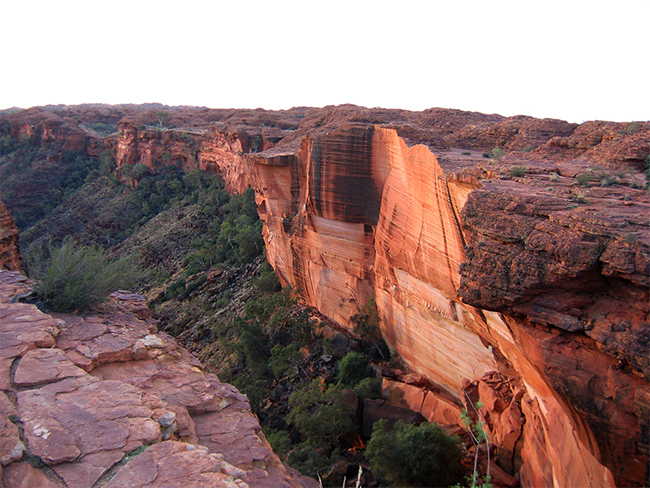 Kings Canyon is a highlight for visitors to Central Australia. The ancient red canyon walls soar 100m above Kings Creek to a plateau of rocky domes. The sheltered creek environments below protect an abundance of flora including the MacDonnell Ranges Cycad. 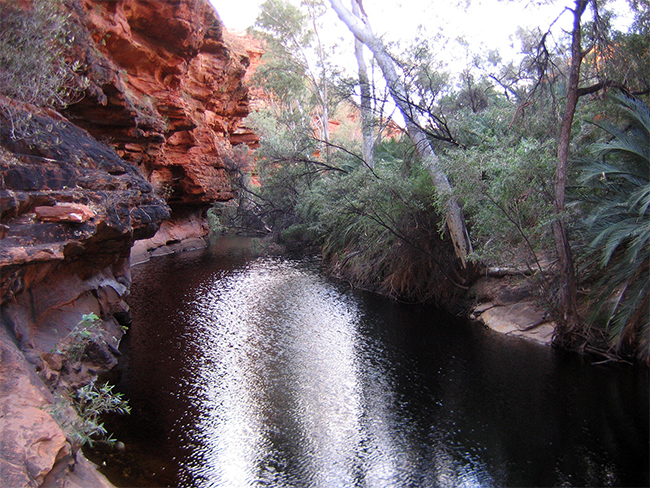 Kathleen Springs is located 21km by road from Kings Canyon. Here the relicts of old stockyards can be seen along the pleasant walk to the permanent waterhole. The full length of the path is paved, and accessible by wheelchair and pram. The waterhole holds special significance for the local Aboriginal people and is important for wildlife, so swimming is not permitted. Get the Watarrka National Park fact sheet and map (928.6 kb). Find out more about the early pioneering history (3.1 mb). Get the geology of Kings Canyon information sheet (1006.9 kb). You can contact the Ranger Station by calling 08 8956 7460. All year round, although the cooler months from April to September are the most pleasant. Unsealed roads may become impassable after rain. There is a heat management strategy in place at Watarrka National Park. This limits access to the Kings Canyon Rim Walk and South Wall Return Walk on days when the forecast temperature for Watarrka is 36°C or above. On these days, visitors must begin the Kings Canyon Rim Walk before 9am and the South Wall Return Walk before 11am. The park is located 450km south-west of Alice Springs and there are three routes to get there. The Stuart and Lasseter Highways and Luritja Road are all sealed and suitable for two-wheel drive (2WD) vehicles. The Lasseter Highway and Luritja Road will bring you to Watarrka from Yulara. A four-wheel drive (4WD) is recommended to travel the Red Centre Way via Larapinta Drive through the West MacDonnell Ranges. You need a Mereenie Loop Pass permit to travel on Larapinta Drive between Hermannsburg and Watarrka National Park or between Glen Helen and Watarrka National Park. You can buy a permit from fuel stations at Kings Canyon Resort, Hermannsburg and from Glen Helen Resort. A 4WD is also recommended to take the Stuart Highway, then Ernest Giles Road leading onto Luritja Road. 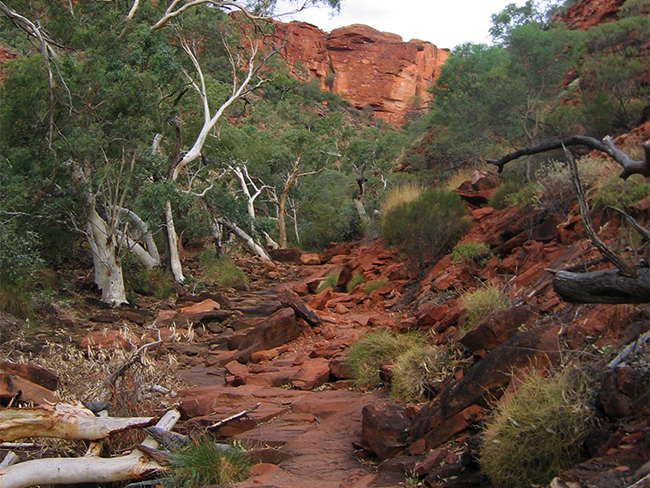 Go to short walks in Watarrka National Park for information on the walks in the area. Overnight camping in tents, caravans or motorhomes is not allowed in the National Park. Visiting Watarrka National Park is a great experience for local, interstate and international school groups. It is important that all groups are safe and respect the environment when visiting. Before visiting the park you should read the Watarrka National Park guide for school groups (1.7 mb).